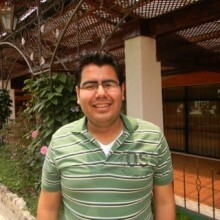 José Augusto Vélez Castro was 24 years old when he became a GOJoven Fellow. His educational background is in Psychology and he did his professional internship at the Metropolitan Health Unit, providing advice to men sent in for domestic violence, and he also sees women who are victims of violence. He would like to continue working in the fields of masculinity and sexual and reproductive health, since he has noticed that many young people in his city need to know more about these topics. In his free time, José is the leader of a music group that plays rock pop.